The request was completed today. 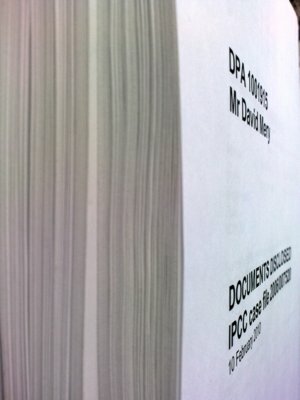 I received two bundles of A4 pages each stapled in the top left corner : one approximately 21 mm thick of 'documents received by the IPCC from the Metropolitan Police Service', and the other, 16 mm thick, composed of IPCC correspondence and some more MPS documents. The cover letters explain that these are all the documents that 'you are entitled to receive under the provisions of the Data Protection Act contained in your IPCC case'. 'The documents have been redacted under section 7(4)(a) of the Data Protection Act' and documents containing legal advice are not included as 'these documents are exempt from disclosure under schedule 7 paragraph 10 of the Data Protection Act 1988.' The amount of redactions means someone must have spent days blacking out the documents. Some of the redactions are over-zealous. For instance some of the questions the officer who conducted the search of our flat asked my wife are redacted in his witness statement but included in the copy of his scene notes. There are no page completely blacked out, but there are pages obviously missing, possibly because they've been entirely redacted. Many documents I had not seen. Some make for very interesting reading, especially the statements my solicitor tried to obtain in vain during our civil action against the police. Here are a couple of highlights spotted in the little time I've spent so far browsing through. Below are a few extracts from the statement of a DS. This transcript is 49-long with page 1 and 49 missing. That's the first time I realise how close I have been to have been bundled up to Paddington Green police station. Another statement below, worth retyping in full, shows that during the IPCC supervised enquiry, the Met fully realised their errors. Unfortunately the investigation report did not acknowledge these findings, necessitating two more years of fighting before eventually getting a formal apology. I have been asked to review the custody record and CRIS reports relating to the arrest of David Mery on the 28th of July 2005. The reason for arrest is given as 'Causing a public nuisance. Caused a major evacuation of three mainline railway stations after his deliberate actions caused police to believe he had explosives'. This is not borne out by any of the evidence presented by the officers. There are grounds for stop and search but I can see nothing to substantiate the deliberate actions, the closure of the underground network and evacuation were the decision of the police and not caused by the suspect. The reason for detention is given as to obtain evidence by questioning. Item 2 on the front page indicates that Mr Mery made no comment when the facts of arrest were explained, however the first entry in the custody log of events at 21:08 is a comment made by Mr Mery. This has been correctly endorsed and signed. The second entry is timed 21:53 stating that Mr Mery arrives in custody handcuffed, there is no explanation for the time gap between these two entries but it may be that all of the normal booking in procedures were completed before this entry was made. A request for someone to be informed of his arrest is recorded at 21:53 and given at 22:09. At 23:00 Inspector L authorises a Section 18 PACE search of the home address, I cannot read the handwriting giving the grounds or nature of the evidence sought. S.18 PACE gives police the power to search for evidence relating to that offence or a similar offence, as the suspect had aroused suspicion by his dress and demeanour it is hard to understand what further evidence could be obtained from a search. Also the only reason recorded for his detention was to interview. The first review of detention was due at 02:57 but was not carried out until 04:20 with no explanation as to why it was delayed, but as interview started at 03:06 this could be the reason. There is no mention on the custody record of what happened on the 31st August 2005 when Mr Mery was due to return to answer his bail. The custody record should have been updated with details of a rebail or disposal. The activity log does not show anything for the day. [3 paragraphs redacted] There is no record that any of Mr Mery's property has been restored to him. It would appear from the nature of the items marked that they were restored to Mr Mery on his release on the 29th July 2005 [they were restored on 2005-10-13]. [3 paragraphs redacted] the OIC [officer in charge] must complete form 60C bail cancellation notice and send it to the Mr Mery. OIC should also inform the custody officer of the decision so that they can close the record. According to the custody record activity log none of these things happened until the 5th of October 2005 when the custody record was opened and the bail record cancelled. On the 13th October 2005 the form 60C was printed along with the property sheets 57G and H.
The circumstances of finding states that the items were "Left at above location following call to suspect package and susp person" The above location being Southwark LT [London Tube] station. This is completely at odds with the evidence provided by the arresting officer who states that an officer removed the rucksack from Mr Mery and then moved it away from him in the underground station. The allegation is recorded as 'Bomb Hoax' this is incorrect and should have been corrected. A bomb hoax requires the dispatch or placing of an article or communication of false information, none of these things happened. Mr Mery was arrested for causing a public nuisance, not causing a bomb hoax. The crime is screened in as a suspect has been arrested but then the report is "No crimed" the next day with no reason given, the no crime is confirmed on the 5th of August 2005. DS B records the results of the S.18 PACE search and the interview of Mr Mery following a briefing from DS W. He notes that there was no evidence visible of causing a public nuisance but the computers will have to be examined. He also records the fact that Mr Mery was bailed to 31st August 2005 so that the computers and CCTV could be examined. Although DS W was assigned the case at the time of arrest on the 28th July 2005 the CRIS was not allocated to him until 28th September 2005 and he did not acknowledged this until the 4th of October 2005. In light of this and the account given in the interview he believes that Mr Mery's action do not amount to an offence, he considers this suitable for no further action [NFA]. This has been discussed with DI C.
There's no separate entry from DI C confirming the NFA authorisation. There's no mention of any forensic analysis of the various items of computer equipment that were seized from Mr Mery nor of the viewing or seizure of the CCTV evidence from Southwark Underground station, both of which were given as the reason for Mr Mery bail to return. There's no mention of what happened on the 31st of August when Mr Mery returned on bail. On the 14th of October DS W makes an entry in the DETS [‘Details of the Investigation” section of a crime report] page to show that Mr Mery has attended with his legal rep and has had his property restored. There is no record of the property being restored or signed for on the custody record property receipts. Observations conducted in the CCTV control room were very important in forming the suspicion that led to the stop and search and then arrest of Mr Mery. In my opinion Mr Mery's actions at the underground station were reasonable grounds for the stop and search of him and his bag. The fact that officers at the scene made the decision to elevate this to a full evacuation and closure of the rail network in order to have the bag examined by explosive officers was one for them and should have been recorded elsewhere. I do not feel that the court would accept that to walk into the tube station as a dark skinned male wearing a baseball cap and a heavy jacket carrying a rucksack and stand on the platform would constitute an unlawful act. The reaction of the police officers caused the disruption to the public and is understandable in the circumstances; to make it the fault of Mr Mery is not. Given that the reason for detention was to obtain evidence by interview this should have been done as soon as possible so that Mr Mery could account for his actions that were observed. There is no mention as to what evidence it was hoped would be obtained from the forensic analysis of the various items of computer equipment seized from Mr Mery and his home address, however it is at odds with the fact that it appears that a USB memory stick and an I-Pod were restored to him on his release without being submitted for forensic examination, both being large digital memory storage devices. None of the property on the custody record has been signed for when restored either at bail stage or at the finalisation of the case. The CRIS report should not have been no crimed as there was a suspect on bail and further lines of enquiry had been identified. [2 paragraphs redacted] before Mr Mery was due to return to answer his bail. The custody record should have been opened on the 31st of August 2005 to record what happened and whether a new bail date was set or the case the case is NFA'd. From Mr Mery's statement he was told on the 31st August 2005 that the matter was NFA's but no paperwork was served nor was the custody record updated. Other threads apparent in these documents include the news that, though the Met claims never to have obtained the CCTV footage, the British Transport Police did request it the next day (I never received a substantive answer to the subject access request I sent them on 2005-08-31); how my normal usual behaviour, termed 'eccentric' by one officer, is what many couldn't accept as normal and hence had to be suspicious; how some of the police actions and decisions appear to be media-driven... Topics to be explored further on the blog. The IPCC still has to inform me on its retention policy, i.e., when my case file will eventually be deleted.